Look about you. Take note. Savour the moment. You'll reminisce about this some day, mark my words… You were there at the very beginning. Before it was cool. Before it took the world by storm. Before it totally jumped the shark. You were one of the original recipients of the Rich Text newsletter. A ‘founder subscriber’, so to speak. Kudos to youdos. To accompany the launch of the new paperback edition, Patti Smith has added a postscript to her entertainingly quirky memoir ‘M Train’. It describes her landing a small speaking part on one of her beloved TV detective shows. Seeing Patti Smith perform live in St Albans a couple of years back was perhaps my cultural highlight of the decade. I really enjoyed M Train too, not least because, in one chapter, she visits the grave of the poet Sylvia Plath in Heptonstall churchyard, visible across the valley from my study window. In my review of M Train, I compared Patti Smith's writing technique to that of one of my favourite writers, the late, great W.G. Sebald. Two fascinating new articles about Sebald appeared online last week. The first article, Ghostly Presences, analyses Sebald's use of understated language and grainy photographs when trying to convey indescribable atrocities (the holocaust, and the allied carpet-bombing of Germany). The second article, W. G. Sebald and the Emigrants, describes his late, brief friendship with a Jewish couple who might almost have emerged from the pages of his books. As an self-proclaimed Darwin groupie, I have long harboured a suspicion that his idea of Sexual Selection (a special case of his more general idea of Natural Selection) might be far more influential in the evolution of new species than it is generally given credit for. Two recent articles on Sexual Selection caught my eye. In the first, Why do only some species look different?, Nick Minor describes a 2014 scientific paper investigating how, in certain isolated populations of birds, differences in appearance evolve gradually over time, hand-in-hand with the ability of birds to recognise the population's new look. In the long-run, this can lead to different populations' evolving into different species. In the second article, What aspect of a male’s song is important to a female songbird?, my friend GrrlScientist describes a 2016 scientific paper examining which aspects of males' songs female canaries use to assess the quality of would-be mates. My partner, Jen, spotted Rachel Roddy’s Roman chicken with peppers recipe in the Guardian. We cooked it last weekend. Very enjoyable—although skinning peppers is always a total pain. The recipe says the dish can be eaten at room temperature or re-heated slightly. I preferred it at room temperature; Jen preferred it re-heated. Which I guess means I've covered my bets in terms of advising you which one to go for. A recent interview with the son of the poet and novelist Robert Graves caught my eye. Apart from I, Claudius, I've never read any of Graves's work, but I'm always interested to read articles about him due to our unusual family connection. A short extract from Rachel Lichtenstein's forthcoming book, Estuary: out from London to the Sea was enough for me to add it to my To Read list. Also near the Thames Estuary, Julian Hoffman has been exploring the Hoo Peninusla. To be frank, I'm surprised he managed to make it out of there: Julian once managed to get me hopelessly lost on a moor I know like the back of my hand. There was an interesting piece on the BBC website about James Brindley, the canal pioneer who changed England. There's a new exhibition about Brindley at the National Waterways Museum at Ellesmere Port. I drive past Ellesmere Port once a week, so I'll do my best to pay a visit. Last month, I saw my first ever spoonbills—nine of them—at Burton Mere wetlands on my native Wirral Peninsula. I almost didn't recognise them! 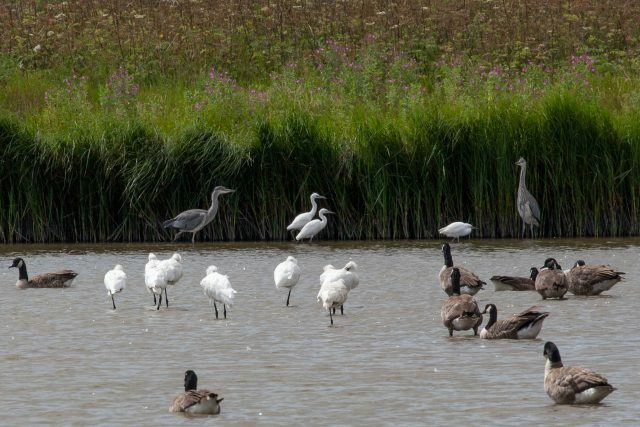 9 Spoonbills (centre-left), 9 Canada geese, 3 little egrets, and 2 grey herons. …What do you mean, what happened to number 10? Haven't you heard: top-ten lists are so 2015! 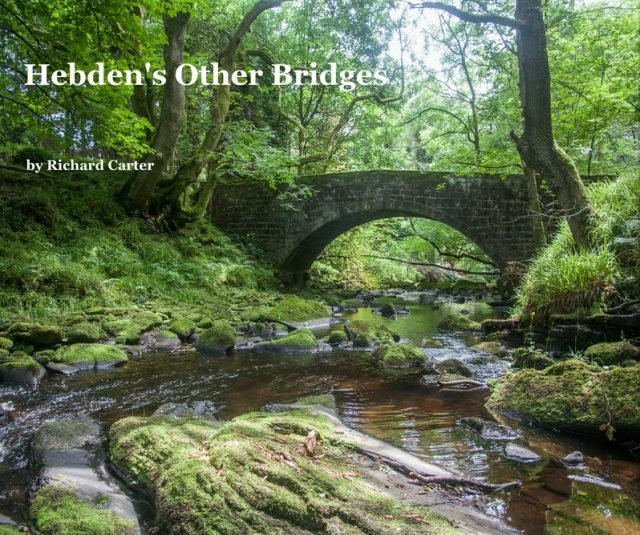 My magnificent photo-book Hebden's Other Bridges is now available to order online. You can read more about my project to photograph the ‘other’ bridges in the Hebden Bridge area in my article Hebden's non-eponymous bridges. As newsletters go, I think it's safe to say this was by far my best so far. Please feel free to contact me with any feedback. And please forward this newsletter to any friends you think might enjoy it, urging them, for the love of humanity, subscribe!